Audits and Controls are key value functions in relation to Financials across sectors for Industry, NGO / Non Profits, Governance and Individual / Families. Strong Controls protect Assets with appropriately enacted and routinely tested checks and balances over Assets. Assets are frequently broader then you may think and there are many ways that even liability instruments like corporate cards and other elements like access to credit lines unguarded fixed assets and more can give rise to ways for value to leave an entity. Controls are a well studied area over the years but remarkably there are always new issues to arise in the area AND somtimes it is a simple lapse of discipline in consistently applied checks and balances that give rise to the opportunitie for value loss in entities and individual / family financials for the failure to use controls wisely to protect assets on a consistent basis. Audits whether Financial, Tax or Regulatory in nature are cross checks to your financials that speak to the elements of attributes of completeness, accuracy, correctness, classification and much more on a Sample Basis frequently driven by applied statistics to extract a sample which is a representation of the whole. From the extracted sample tests and routine tests on Entity Fianancials, Taxation and compliance, much can be learned of an Entity and it's estate of Financial Management. But Financial Managment can only ever aspire to be as good as the skills of Senior Management to understand and value the tools of financials. This is why one of the start points on Audit is the Board and Senior Managements perspective and atttitude towards financials including the applicable sets of laws, rules and prinicples that guide financials. A dismissive perspective of Senior Management in relation to Controls or the framework of applicable laws, rules and regulations could be a key sign of risk withing an entity as good Corporat Governance works top down and the best of Accounting Policies and Procedures will require the buy in of Senior Management and a culture of Compliance to match good theory to good practice in the applied enviroment. You cannot independently reach full sucess on Accounting and Controls without management buy in and one of the challenging points for ethical CPAs is that you need to draw the line where management will not or cannot at times. This is a well documented point in the Analysis of Audit and Internal controls that Management mindset is a key element of Controls. Risk factors may be Economics, Fiscal Challenges and a lack of willingness to conform to a governing set of laws, rules and policies.Reviews of case studies on negtive outcomes on Financials will indicate most frequently the role of permissive or willful mismanagement away from Audit rules , Financial, Accounting, Tax and Regulatory rules as a key factor in points where Financials invariably subscribe to a relevant framework of Laws, Rules and Governance in the Economy at one point or the next. We will strengthen this with time to explain with thought chain to the various study support lines so you can see this with more clarity case studies, facts and surveys but really it is not required as this is self evident each day in the economy through financials and the report of the outliers and their fines and litigation. Corporate Governance is a key element of an effective chain of Controls over financials as are Internal Controls and Audits. For those that find themselves in difficult positions on implementation lines for laws, rules and governance through financials. Where Accounting Policies designed to enact strong controls may take time to implement, you can simultaneously use good housekeeping on financials to get the process started: the transactional level of details where the who, what, when, where, how and why of matters must be accounted for as these key elements for all expenses rolling through financials at entry points to the ledger can strengthen the input lines for absequent analysis and understanding of validated costs, revenues and related transactions in ledgers. Uniformly if you can answer these questions than you have a strong knowledge of expenses rolling in and that knwoeldge communicated to the ledger is of strong value to analysis, controls and the output lines of reporting in support of Transparency through financials. BLS defines elements of where Accountants and Auditors add value here on Controls and Audits. BLS is a good point for Understaing this in context as BLS is the home of many Labor Economists and Statisticians at work studying the role of Auditors and Accountants at work in the Economy to in part asses economic value added. Public accountants perform a broad range of accounting, auditing, tax, and consulting tasks. Their clients include corporations, governments, and individuals. They work with financial documents that clients are required by law to disclose. These include tax forms and balance sheet statements that corporations must provide potential investors. For example, some public accountants concentrate on tax matters, advising corporations about the tax advantages of certain business decisions, or preparing individual income tax returns. Find your way to Our Additional Lines on Audits, Reviews, Compilations and More which add more to the Context of the Accounting vs. Audit role and the general lines on value we can add to the various needs on Risk Management, Controls, Accounting, Financials, Audit and more in the Economy and Financials. with the conveyed knowledge that we have deep lines on the Global Ecosystem of Audits and Controls for the Economy, Financials, Policy, Cross Sector, Community and Societal needs including IT and Risk Management needs on GRCs, IT Controls, Risk Management, IT Audit and more. We look to the broad lines and the narrow lines of Entity Value and Quality Assurance, checks and balances in the Economy and Financials with the lens of Economic, Financial, Legal, Cross Sector and Societal Research. For the immediate point on Entity Value and for the Broad Lines of value to help on Policy needs in the economy and financials. 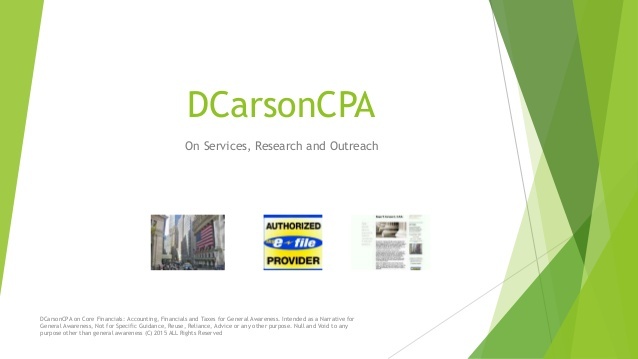 DCarsonCPA on Audits and Controls a strong approach to ramp up support on Controls and Audits. Support lines on Project Teamwork we work with integrated lines on Economic, Statistical, Financial, Legal, Technology, Cross Sector, Policy, Compliance and Societal Research to help on needs on Controls, Quality Assurance, Risk Management, IT and Conventional Audit Teamwork and Prep lines as relevant. OECD / IMF and WB on Audit and Controls.